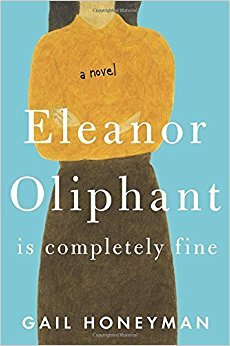 Review: Eleanor Oliphant is completely fine. She wakes up, she goes to work, she eats and she sleeps. On the weekends she treats herself to pizza and vodka, and once a week she talks to her mother on the phone. She has no friends but that's okay, Eleanor is fine with that. When Eleanor and Raymond, the IT guy at work save a man who fell on the sidewalk, Eleanor's life is changed forever. Have you ever a read a book that kind of sneaks up on you and surprises you? This book did. I honestly don't know where I ever heard about this book, I think my kindle recommended it to me based on something I had read so I downloaded it without even reading what it is about. It was a slow burn. Eleanor annoyed me at first, she's very cut and dry and brutally honest about things (I'm not sure if she was supposed to have Asperger syndrome but I think it's a possibility). There was some humor in her bluntness which I appreciated though as the book went on. I really loved this, it was sad but uplifting and makes me want to hug all the office loners next time I go to corporate. I do not light up a room when I walk into it. No one longs to see me or to hear my voice. I do not feel sorry for myself, not in the least. These are simply statements of fact. I have often noticed that people who routinely wear sportswear are the least likely sort to participate in athletic activity.